Use fingerprint recognition as an alternative to entering passwords in certain apps. You can also use your fingerprint to verify your identity when logging into your Samsung account. Important: Fingerprint recognition uses the unique characteristics of each fingerprint to enhance the security of your phone. In rare cases, the sensor may recognize a fingerprint that is similar to a registered fingerprint. Note: You must set up a Pattern, PIN, or Password. 5 Follow the on-screen prompts to register your fingerprint. Disclaimer: Make sure your device is connected to a Samsung account before setting up a screen lock. Don’t forget your credentials to your Samsung account, or your PIN, pattern, or password. Write them down on paper or in electronic form, if necessary. You may lose access to the data stored on your device if you don’t respect those security rules. Remember that it is not mandatory to set a screen lock to use your smartphone. Note: You can register up to four fingerprints. 5 Enter your lock screen credentials. 7 Follow the on-screen prompts to add an additional fingerprint. Note: Fingerprint security can be more than just a way to unlock your phone. Use your fingerprints to verify your identity with Internet and other supported apps and make payments quickly and securely with Samsung Pay. 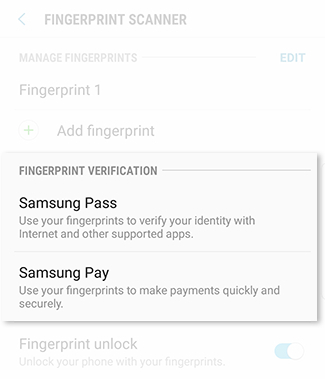 • Samsung Pass: Use your fingerprints to verify your identity with Internet and other supported apps. • Samsung Pay: Use your fingerprints to make payments quickly and securely.